For many, the only thing better than enjoying a good time is the ability to share those moments through social networks and messaging via mobile devices. Corona wisely put a summer campaign together that taps into those interests. "Mobile and photos go about as well as beer and a lime. 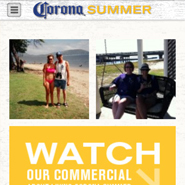 Corona's target audience not only enjoys a good time, but they enjoy sharing those moments. You can read the rest of today’s article here http://www.mobilemarketer.com/cms/news/content/15470.html. Tagged with Corona, photo sharing, messaging, social networks. June 3, 2013 by Jeff Hasen.